Weightmonitor UAE, an online & mobile app based weight management service, has made its debut in the Middle East fitness and nutrition market with an introductory offer of a free service for the first month. Weightmonitor UAE understands the goals and objectives of the users and based on their existing lifestyles, health and medical conditions designs a diet plan for them, a statement said. Whether the person is suffering from diabetes, thyroid, blood pressure or looking for a weight loss program post-delivery, weightmonitor UAE offers its users unrestricted access to a dedicated personal nutritionist and its proprietary motivational scoring tool to help them achieve their objectives and stay fit without having to visit a fitness centre, nutritionist clinic, machine based weight loss programs or use of ineffective diet regimes, it added. The entry of weightmonitor UAE in the region comes against the backdrop of rising cases of obesity with the average UAE resident being classified as being overweight with a BMI of about 25.6, a statistic, which, according to the spokesman, the program aims to reverse. Obesity continues to be a serious concern among Dubai and UAE residents at large with current statistics painting a grim picture of the situation. A recent survey by Zurich International Life showed that slightly over 47 per cent of UAE residents were overweight with most of them clocking a BMI of between 25 and 30. According to a senior UAE health ministry spokesperson, obesity induced diseases such as Diabetes in the UAE has affected 19 per cent (1 million residents) of the population and already accounts for 3 per cent of all deaths in the country. 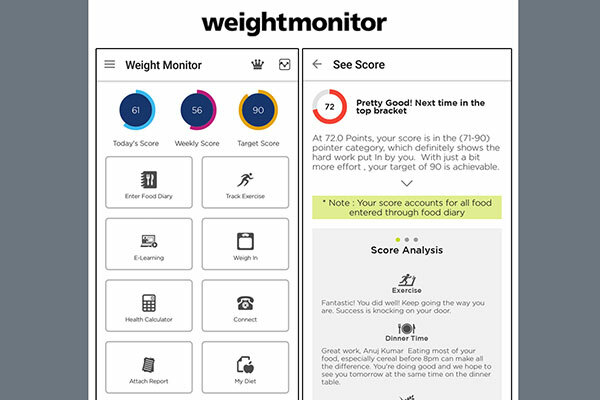 “By pioneering UAE’s online and mobile app-based weight loss space, weightmonitor UAE comes as a sigh of relief for residents who are looking for a result oriented solution while at the same time factoring in their financial muscle, limited time, existing lifestyle, available food and technology,” said Dev Khosla, founder , weightmonitor UAE. With its unique and unmatched price point of AED499 for a three-month program, weightmonitor UAE users get access to a nutrition expert multiple times a day and also enjoy up to six diet plans as part of the three-month program. Consulting a nutritionist is not covered in the insurance most often and can be quite expensive. However with weightmonitor UAE you can get a daily food diary and a score review, weekly weight check-ins and a medical report analysis, which can be conducted via Skype meetings and App chats with their team of in-house certified nutrition experts under the training of India’s top nutritionist, Ishi Khosla. According to Ishi Khosla, the online and mobile weight loss program will help the user to not only lose weight consistently and stay fit all through, but also learn how to maintain and live a healthier lifestyle for life. “weightmonitor UAE offers its users the ability to conveniently start an effective and sustainable weight loss program, consult qualified and experienced nutritionists, and motivate them to stay committed until they reach their desired goal and beyond.” said Ishi. And to show its commitment to transforming Dubai into a fitter, healthier, and stunning city, weightmonitor will be available to users for free in the first month after the launch. This offer will run from April 1 to 30 and users will get access to its premium service.